Product information "1300 Years Bulgaria. 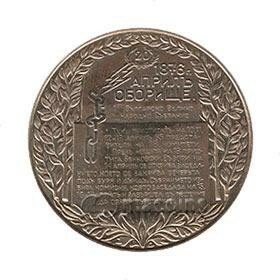 Oborishte"
The obverse depicted the seal of the Bulgarian Revolutionary Central Committee. Below is the nominal value of 2 leva and the year of issue – 1981. In the outer circle of the coin has an inscription “1300 years Bulgaria PRB”. The reverse side depicted a monument of the Oborishte area. Related links to "1300 Years Bulgaria. Oborishte"